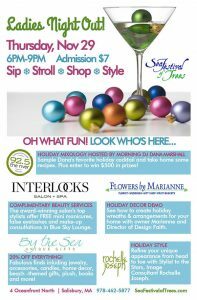 The Sea Festival of Trees is in full swing, and the Blue Ocean Event Center is excited to announce Ladies Night at the festival! Gather your gal pals and join us for a night of merriment with the River’s morning show host, Dana Marshall! Enjoy cocktail mixology and sampling, holiday demonstrations, shopping discounts, amazing door prizes and more! Plus, you’ll be able to meet stylist to the stars Rochelle Joseph! It’s all happening at the Blue Ocean Event Center on Salisbury Beach on Thursday, November 29th!